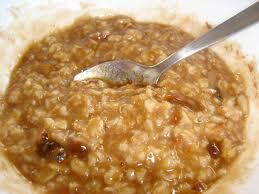 Porridge: Remedy for fat and diabetes. One can fight obesity and diabetes by controlling the diet and regular exercise. Yoga exercise are simple but highly effective. You will find below a simple formula to cook for anti diabetic diet and get rid off these diseases by practicing Yoga. Take Wheat, Rice, Millet and Moong lentil in equal proportions by weight. Get the mixture by taking 500 grams each of the grain. Roast the mixture on light fire. After roasting one needs to use a mixer to grind the prepared stuff lightly. Ensure that the resultant mixture has the size of sugar granules. Add 20 grams of ajwain and 50 grams of sesame seed. To cook for one person tale about 50 grams of the ready mixture. Soak the mixture in water about 5 hours prior to cooking to soften the millet. Add some green vegetables like peas, onions, cauliflower, spinach, one medium sized potato, two medium sized tomatoes, salt and pepper to taste. Put all this in 400 ML of water. Boil in a pot until the porridge is cooked. Consuming this preparation regularly for fifteen days is sure to reduce the weight of the person wanting to shed extra kilos. Person suffering from diabetes will note that they have better stamina and feel fresher and cured if the diabetes is not advanced. One may arrange and check the pathology parameters every ten days. It would be good to make a habit of taking the porridge every day. It is recommended to exercise every day, preferably during the early morning but empty stomach. One should sweat by the time the exercise period is about to finish. You can be certain to get promising results if the above mentioned routine is followed. Take natural sugar in the form of fruits or honey or maple syrup. For the other diets during the day, one must eat only in a restrictive manner to live.